Having come to terms with film marketers not having my viewing pleasure at heart I have slowed down my trailer intake in an effort to leave some surprises and plot for the actual film viewing. But after seeing a bit of the trailer for The Town for the first time my curiosity was piqued and by “a bit” I mean I watched it with the viewing equivalent of bad speed reading, kind of watching but not really taking it in. The trailer did make The Town look like a procedural Cops n’ Robbers films, maybe even a little inner city Point Break, albeit with a really interesting cast. But I guess the real draw for The Town for me was seeing how Ben Affleck fared, let’s be honest somewhere after winning the Best Screenplay Oscar (shared with Matt Damon) for Good Will Hunting he hasn’t exactly lived up to the expectation. Even though he has acted in an incredible range of films; romantic comedy, Super hero, historical epic, high action, sci-fi, political intrigue, etc. Most of these films have really sucked. In his defense someone must be watching them because he continued to make them for quite a while. These days an Affleck film seems to be the underdog even before it’s out the gate. All this while his partner in crime Matt Damon seemed to be more careful with his choice of roles and garner both critical acclaim and much respect (& power) in Hollywood. Recently Affleck seems to be turning things around – I thought his 2007 directorial debut with “Gone Baby Gone” was OK! I suspect that it may have actually done a lot better in the UK had Affleck not held its promotions and release back out of respect for Madeleine McCann’s family who were undergoing a similar horror scenario as the one depicted in “Gone Baby Gone”. I also though he was one of the better things about 2009’s “State of Play” where he played the rising politician who gets caught up in a scandal helped by a college friend played by Russell Crowe. Sometime last week I managed to watch The Town trailer in its entirety. Wow! My perception of it changed. The camera work was tip top and the acting leaping off the screen I was thinking; Heat, The Departed and any number of great films from John Frankenheimer. In case you are unaware of John Frankenheimer, try get hold of some of his films he is a master of drama/action and chase film. Crikey! I just noticed that Affleck worked with Frankenheimer on Reindeer Games back in 2000. I’ll need to watch that again, as I didn’t like it when I saw it back then. So I’m sitting in a comfy seat in a screening room the lights dim, the projector fires up, the Warner Brothers logo flashes up and The Town starts. We are dropped voyeuristically straight into an action scene. A hard hitting, gritty yet slick action scene mind you. I slowly realize that there is no slick banging soundtrack that has become de rigueur for this kind of action scene. Instead the film relies on the rather spectacular tight camera work, fast paced editing and anonymous acting to engage the audience – while a masked gang assaults a bank with military precision and savvy. This is our introduction to the “not f*cking around crew” (or the “not screwing around crew” if you are watching the trailer) as named by Jon Hamm’s FBI agent Adam Frawley. Based on the award winning novel Prince of Thieves by Bostonian Chuck Hogan (glad they changed the name for the film) The Town is named after Charlestown, a one square mile blue-collar neighborhood of Boston where the story is set. There are over 300 bank robberies in Boston every year and most of the professional perpetrators live in Charlestown (The Town). During the 50s and 60s Charlestown was the home of the Irish mob and their influence is very much still felt. What The Town successfully does (many other films fail in this respect) is create a world where there is no single focus, rather it’s about a number of threads of the central character Doug MacRay’s (Ben Affleck) life that entwine to make a compelling and singular roller coaster ride. First and foremost it’s about Charlestown and its tight knit community and how the modern world encroaching on them is affecting their neighborhood. As well as the life that many of its residents of Charlestown are born into. Crime is like a trade passed down from father to son, as is the case with Doug MacRay – the brains of the “not f*cking around crew”. MacRay’s tenuous relationship with his father is also a major thread into the story. It’s about the tight bond between the crew members as they try to not be caught or killed. A big part of this is the increasingly tension fraught relationship between childhood friends MacRay and James Coughlin (Jeremy Renner) an ex con who is the Crew’s muscle and flicks between charming to menacing trigger happy hardman in a breathe. An added complexity that’s central to the story is the budding relationship between MacRay and the fragile Claire Keesey (Rebecca Hall). If you have seen the trailer you’ll know that Claire Keesey is held hostage by the crew at some point. So as well as the usual new relationship tension they have some big hurdles to overcome. You don’t get to be a successful and brazen crew without raising the attention of law enforcement and tenacious FBI agent Adam Frawley’s (Jon Hamm) net is tightening on the not f*cking around crew. Although MacRay’s crew is successful he knows there is a limit to what they can get away with and feels the heat being turned up. The Town brings all of the above elements together into one great and well made heist movie – dare I say up there with the best of them. I really felt like I was watching classic 70s Frankenheimer, at one point I started to wonder if there was going to be a chase scene as a Frankenheimer film would have. I was not disappointed. Even the gritty effect caused by the contrast in Black white high definition gave the film an old school feel. Too be honest only when the final credits started rolling did I realize Ben Affleck directed the film. Which bodes well for his growing credibility as both the cinematography and direction are flawless; Affleck has been learning a lot over the last 20 years or so. The tight camera work adds to the growing tension in MacRay’s life. The dialogue is spars but on point with most of the cool lines going to Affleck. The cast is sublime, come-on we are talking class acts; Jeremy Renner, Pete Postlethwaite, Chris Cooper and Rebecca Hall delivering powerful performances. I should mention the surprise performance from Blake Lively (yes Blake Lively from Gossip Girl, soon to be seen in The Green Lantern) and I’m really glad to see Titus Welliver on the big screen. You’ll recognize him from his many small TV roles but he has a huge presence and I hope to see him in bigger roles. 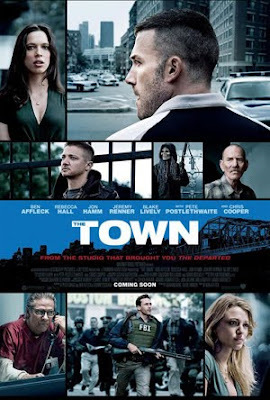 I enjoyed The Town and thought it was a good film easily Affleck’s best film as he only slightly clings onto the novelty that his coolness is enough to sell a movie. I did feel that some of the characters only pop up in the story to advance the narrative, particularly the remaining crew members, Blake Lively’s character and FBI agent Adam Frawley (Jon Hamm) who seems to be an extension of his anonymous Mad Man character. His unreadable blank aura works for Don Draper, not so much for what is supposed to be an intelligent, tenacious crime fighter. Possibly this is a character device used to make us more sympathetic to MacRay – the criminal. Either way it’s a shame. There was also a scene at a crucial part of the film that lacked some credibility for me, slightly deflating some of the credibility that film up had built up to that point – MacRay already in a corner, is presented with a possible clue to larger machinations but his reaction is somewhat astounding given that he is the brain in a high pressure illegal occupation that relies on surprise and meticulous planning to succeed. I would be interested to know your thoughts if you go see it. Unfortunately by the time you see The Town the hype machine will have Ben Affleck’s face all over the place and exposed every clever plot device devaluing the quite confidence a top notch heist film like The Town should have. Visit The Town from Friday 24th of September on a big screen near you.